What does it take to run across the Sahara? Oakland local Magdalena Boulet found out in April of 2018 as she navigated the Marathon des Sables, a six-stage foot race through 250 kilometers of Saharan desert in Southern Morocco. I recently caught up with Magda, the VP of R&D at GU Energy Labs, after the race. We chatted over beer about her victory in her debut attempt at the race. 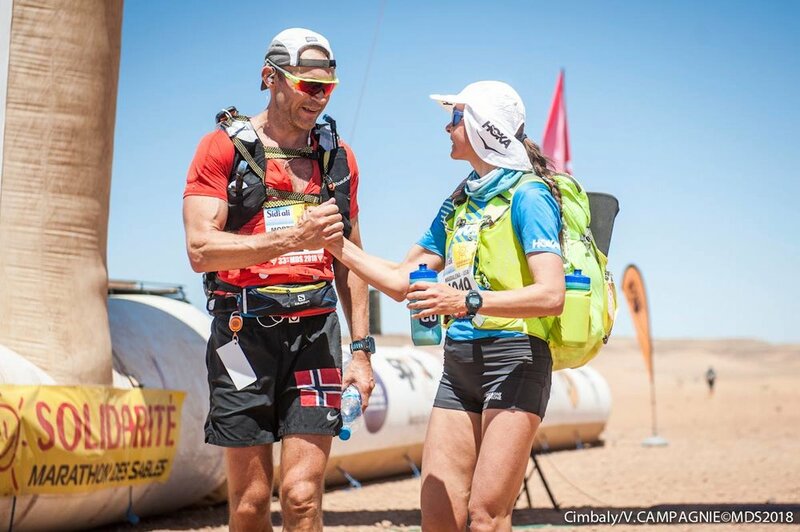 In the lightly edited interview below we discuss race and packing logistics, how to survive a multi-day event on limited calories, what motivates Magda, and where sand ends up after 150 miles of running in the desert. You can listen to the audio recording of our conversation (which begins abruptly with a discussion about my iPhone battery) on Soundcloud. Magda, congratulations again on finishing and winning the Marathon des Sables (MDS). So how goes the recovery? I'm about a week out from the race. And <laughs> I've not done much. I'm just trying to mentally process the whole experience and I am still making up some of the calories lost. It's been a week and a half and I'm still below weight. I haven't exercised and I've just been eating. How much weight did you lose? By the time I got home it was about 6 pounds and that was with two-and-a-half days of consuming calories after the race. If I had to guess, I'd say I lost close to eight pounds. That is a lot of weight! Walk me through some of the logistics and rules that makes this race across the Sahara so depleting. Marathon des Sables is a stage race, no? It is a six-day stage race, including a ceremonial stage at the end. But the exact nature of each stage is not revealed until right before the start—you don't know the exact distances of the individual stages. The race is always 250 kilometers over seven days, but you don't get the course book until you arrive in Morocco. This longest stage is 53 miles (80K), which the organizers give participants two days to finish. What are some highlights from the race rulebook? You have to start with 6.5 kilos in your backpack, which includes your mandatory gear. You must carry 2,000 calories of food for each day. You have a list of a dozen required equipment pieces—venom pump, compass, mirror, safety pins, antiseptic, whistle, sunscreen, your passport, and €200—so that if something goes wrong you have it on you. If you get lost, you can find your way back; if you get bit my a snake or scorpion, you can take care of yourself. That list of equipment has to be on you at all times and they can control check you at the end of the stage. Marathon des Sables' packing guide. The list is extensive for a reason... they've done this for 33 years. But it all adds up to weight you have to carry. So this means that a lot of the race logistics happen prior to showing up: spending time to research the lightest compass, the lightest mirror, etc. It needs to be functional, so you have to be resourceful with your weight. I had a nice spreadsheet that let me compare three different tents to compare warmth versus weight and balance comfort with the weight that I carried. But there's other stuff. They put a tracker on your pack and you must carry punch cards for water. One of those controls affected the race, right? Yeah, on the first day. Natalia Sedykh from Russia was the returning champion. This was her third time at MDS. She definitely was not a rookie and had equipment and running experience in the desert. After the first day, both of us got pulled into control to weigh our backpacks and go through mandatory gear. She was missing one of the pieces... her whistle. Again, not a heavy piece of equipment, but she either lost it or missed it. A lot of whistles come attached to a pack and maybe it got ripped off. I made a conscious effort to cut off the whistle that came attached to my pack. I put it in with other mandatory gear in a ziplock bag, so it would be all together. So they required 6.5 kilograms, but did you end up carrying more weight for extra food or equipment? I went as light as possible, which required me to make some difficult decisions the night before. When I went to weigh in, my pack was higher, but it also had my pre-race dinner and breakfast. When I started my pack was probably just a couple hundred grams over 6.5 kilos. Wait, so that 2,000 calories you mentioned... that's per day? That is your breakfast, your running fuel, and your dinner? Yes, that includes your breakfast, your snack, your racing fuel, your dinner, every single calorie that you put in your body. And you are running a marathon every day... so that is not a lot. That's practically nothing. I mean, never mind just being in the desert. Yeah, I mean being athletes, and being in those conditions requires a minimum of 1,500 calories per day. Good lord, so if you are carrying all your food. What exactly are the race organizers moving from start to finish? They move water and tents, and set up the start and finish areas. And we are not talking about a Mountain Hardwear tent, I mean a Moroccan wall of blankets. They were heavy sticks that were adjustable so you can lower the tents and cloth to prevent sun and wind from blowing in too much sand. It's a really clever system. The tent bivouac between stages. Photo: CIMBALY/MDS2018. So, you also have some privacy to bathe, wash, and change? Uh... I would not go that far. Privacy is not the word. You are in a tent with seven other people, so eight to a tent. The advantage of being one of the front runners is that you can definitely take over the space for your washing before your tentmates get back. But after a day or two, there is a lot of semi-public bathing going on. Whatever you need to do to take care of yourself and make yourself feel better... that happens. You mentioned there was a "punch card" for water. I noticed watching video from the race that all the water was allocated in bottles. Was there a water quota? Yes, absolutely. Water was controlled. You learn to pace it out and conserve it quickly when it is a precious resource. So after a stage you might think, "Ok, I know I want to clean myself, but I also need to make my breakfast and dinner, which requires water. I also need to have enough for my water bottle tomorrow. Oh, and I'd like to wash my hands after I go to the bathroom." The "shower" was something that was really nice to have, but yeah it didn't happen every single day. Oh. So they had a shower? No, you took one of your water bottles, punched holes in it, and dripped it on you. Again, only 6.5 kilos. If you think about it, my food was more than half of that weight. I wore the same pair of socks, shorts, and racing shirt for seven days. Every time I got back from a stage, I had a ziplock bag in which I would sprinkle some water, toss my clothes in and wash my stuff really quickly. It would be dry in less than an hour. And I carried some clean clothes I would hang out in until the next day. Before the race, I had a chance to pick up your weight vest you used for training. I recall it being pretty heavy. What was that, about 35 pounds? Yeah, I'm not very strong. <laughs> Preparing for the race with a race vest was definitely a progression over several weeks. Ian Sharman has done that race a couple of times. Picking his brain regarding the weight of the pack was a huge part of my preparation for this race. I started walking to the work with vest. Then I built up to running to work and hiking back (because it is uphill on the return). Then I started to do the weight vest plus my backpack. So I got up to about 30-35 pounds commuting to work over about 8-10 weeks, but I was introducing more weight and speed very gradually. It took some time adjusting to the weight. The first time I wore the vest, it was really uncomfortable. My muscles were sore and I could feel that my joints... <laughs> I was definitely aware of them. I adapted after a while and I could add more weight. It is always interesting to me how when you add weight onto your body, even a minimal amount of ten pounds into a pack or vest, the activities you take for granted suddenly become much more difficult. Right, even ten pounds that you are not adapted to can make a difference. Given this work with the weight vest, did you feel prepared during the race itself? Did the weight of your pack feel easily under control? Yeah. My expectation was that every day I was going to consume 2,000 calories or more, so I actually made a decision to carry additional calories in exchange for some comfort. I left my phone behind, I left my thermarest behind, which added up to 1,000 calories I could carry. But yes, by the time I arrived I was really comfortable wearing 6.5 kilos. But I did have a false expectation that the bag would feel lighter as I consumed calories... after each day, it kind felt the same. <laughs> Midweek I thought, "I've already eaten 5,000 calories! Why is this still feeling so heavy!" Hah! How were you taking the calories? Were you doing powders and water or a combination of solids/gels/liquids? Everything that I had was close to powder form. It was the lightest form. I did not want to carry an extra 100 grams if I did not have to. My breakfast consisted of overnight oats mixed with my recovery protein powder and the water from the punch card. The oats would sit over night and when I woke up the meal was ready. I would eat that about 2-3 hours before the start of the stage. An hour before I would have a Stroopwafel with nut butter. During each stage, while I was racing, I had GU Roctane drink, which I would refill with water at each control point along the route. I tried to only carry enough from aid station to aid station, so that I would not show up with extra fluid in the bottle. Carry just enough to get to each check point. After each stage, I would immediately have my recovery drink, plus a little snack of a Stroopwafel with nut butter. Dinner was instant mashed potatoes with curry or cheese. That dinner was a big deal! I was looking forward to it and it tasted like the best thing I've had in my life. Instant mashed potatoes, very good! Instant mashed potatoes... that sounds familiar, didn't Luke Nelson use that on his Bear's Ears traverse last year? We designed that for him! I was very grateful to work with Luke on that project because it gave me a sense of confidence that I could take a lot of what was learned and apply it to Marathon des Sables. Every day was as surprise for me doing this the first time, plus the unpredictability of the weather, the course, and visibility. We knew the layout of each day, but there were sandstorms coming through at night and during the race. The temperatures were not quite as high as in previous years, but there was a lot of wind. Sand must define the experience in a lot of ways. You just have to embrace it. There is sand 24/7, just everywhere: in your food, in your tent, on you. After the first day, I realized that we were going to be covered in sand all the time. We're sleeping and you feel this layer of sand brushing against your face. After a few days it is in your sleeping bag, in the seams. You will be laying down about to fall asleep and will feel this trickle of sand along you, and you get worried it might be an army of ants or insects, but it's always just sand. It's just coming out of your ears by the end. Photo: Ian Corless. Check out Ian's stunning images from the 2018 MdS. How did you manage your shoes? On social media I noticed some elaborate gaiter systems. The race didn't start when I reached Morocco; it started two month prior to it. As I started to learn and analyze the gear, I read race reports from people who had competed in the past. The gaiters are a big piece of equipment that can make or break your race. So I reached out to Hoka, who supported a couple athletes at MDS before. They showed me how to velcro the upper gaiter material on, and that you can't just glue the velcro on (which would just get ripped off in the sand), you've got to sew it on. This was my first time racing in gaiters, and I was surprised how well the system worked. What shoe were you attaching this to? I was wearing the Clifton. Would trail tread have helped on that terrain? No, my Cliftons were great; they held up awesome. I was trying to go as light as possible, which seemed important from a psychological perspective. Feeling good running was important, and I was already adding weight with the gaiters. I got blisters, but they were manageable. There were plenty of people who dropped out from blisters, but this was more than just your average chaffing. We are talking real skin loss; it was difficult to watch. But that was one of my takeways. People who show up to this race is such a wide spectrum of people who've done the race ten to twenty times with a lot of experience, to people who are doing it for a cause or charity that I have never run a marathon, to elites and age-group competitors. It was serious business for folks to get into the top 50; people would pour over the rankings everyday. The tents seem pretty social and communal. Did you get to interact with a lot of folks? That was my favorite part: getting to know people and getting to learn backgrounds of people in this race. My tentmates were incredible. The organizers put us in groups of similar background and nationality. We had a Canadian, a French person, and the rest of us were Americans. But everyone spoke English which made it a lot of fun to share stories every night. We had all levels: from the US marshal for Americans in the race who was at his thirteenth start, to a couple guys who had done the race in the past, to people totally new to ultras, to me and some other elite athletes. Runners in tents before a race stage. Photo: CIMBALY/MDS2018. Ok, so let's get to brass tacks. What was the allure of running through a desert in Morocco? Marathon des Sables race is famous beyond the ultra community as the idea of running across the Sahara is intriguing even for the mainstream press. But were you intrinsically motivated to do this race or is this fitting in a larger calendar of events? Several things. One is the desire to put a check next to the event. When would I ever just make the time to cross the Sahara Desert? I had never been to Africa and this race is well known and defined as one of the toughest races in the world. But it's tough for more reasons than just running through the sand and the desert, due to the logistics and what it requires you to embrace along the way. Marathon des Sables is also part of the Ultra Trail World Tour, which allowed me into the race. I applied for a spot through UTWT, which is the circuit that includes UTMB. This race is ranked with UTMB as one of the more challenging. So that was the attraction. I think that after so many years of racing, I continue to search for things that make me feel uncomfortable. I keep asking myself, "So, now... what's next?" MdS was hard, I got through it, but where next? I'm not sure where the journey is going to go to get that level of satisfaction. How scary do I have to be to feel rewarded? That's how it usually starts, but then I learn there is so much more to an event. At MdS I got much more out of it than just overcoming my fear of an intimidating challenge. What was the biggest thing you learned at the Marathon des Sables? What surprised you during the race? I'm surprised at how many tough people are out there. There were 1,200 people that showed up and the majority of them made it to the finish line. Every morning I was amazed how many people got up and started each stage after I watched them limp around and moan the night before. Yet they got up and moved through it. I was surrounded by that the whole time. Runners navigate the sheer expanse of the Sahara. Photo: CIMBALY/MDS2018. Usually you go to a race, where you start and finish maybe being invested in a few people in the race. But watching my tentmates was incredible. They took up to two times as long to finish some stages, and they would show up with a big smile on their face. I would ask them how it went and they would shout, "It was the most amazing thing!" And they would be just rolling in as I was eating dinner. That was impressive. I learned how important how important your tentmates are to finishing a race like that. Their attitude is important. You are spending a lot of time together, talking about the stages and the next set of challenges. Or you are reacting to a sandstorm together. This race is more than just your running. It's about how you deal with adversity and the parts outside of the running part that will put limits on how well you do each day. You can get easily frustrated by what is thrown at you. When you have to hold down the tent for an hour and a half because the wind is blowing so hard that all your stuff is going to disappear, you can get really angry. You can sit and complain. But I got lucky; my tentmates made my experience pretty positive. They all finished! And it came pretty close. One of my tentmates had to get an IV, which is a two-hour penalty. But we made a decision together for him: "We need you at the finish. Number 92 is going to make it to the finish." It didn't look great, and in the moment, I would have said there is no way he is getting up tomorrow and starting to run. But he made it. My favorite stage was the last stage. We all walked together for 7K and it took us 90 minutes. I had the biggest smile on my face walking with my tentmates celebrating what we got through. "Solidarité." Magda with Morten Grønneberg. Photo: CIMBALY/MDS2018. Was that the most enjoyable post-race shower ever? Definitely. It took me two showers to clean-up. After the first one, I got dressed up and was sitting at dinner and found sand behind my ears. Hah! So what is next? After this, I think that UTMB pack is going to feel pretty light. Ok, let's finish up with a couple quick-split questions. I have a feeling I already know the answer to this, but what is your go-to shoe for a hard run? Not something for super technical trails or race-specific events, but when you need a reliable shoe, what do you lace up? Oh, something really simple. Rice with avocado. Some olive oil and maybe a poached egg. But no vegetables. Too much fiber. And it's the hardest thing for me to give up before a race. Do you have a favorite beer at the moment? Ah! I'm so into wine right now. Okay, favorite wine then? Is there a varietal or vineyard that you are digging? Let's go with Preston from Healdsburg... a nice petite syrah. I haven't had beer in four months. What is your favorite run in the East Bay? Oh, that's pretty easy. Skyline Gate in Redwood Park, looping through French Trail to Dunn, before coming back on Bayview. That's my go-to. It's where I need to go to get some quiet and not see to many people. Read Magda's race report from MdS at iRunFar. You can follow Magda's running and adventures on Instagram. She is a sponsored athlete for Hoka One One and a coach at Sharman Ultra. A special thank you to the media managers at Marathon des Sables for allowing me to use the amazing photography taken during the 2018 race. Take a moment and enjoy the incredible images they have posted onto Instagram, Facebook, and Twitter. You can learn more about Marathon des Sables at their website. Hey, I've got a newsletter. I write a weekly newsletter, mostly relating to running news in the Bay Area, featuring interviews, upcoming events, curated news, and outdoor content.